COG professional team of estimators provide a complete array of pre-owned office furniture liquidation services to our clients, ranging from immediate furniture disposal and lease space cleaning services, to immediate furniture purchase by CONTINENTAL OFFICE GROUP, LLC. 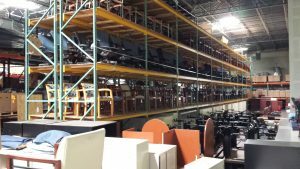 Our normal liquidation proposal process is to visit the site where the furniture to be liquidated is located, take a detailed picture based inventory, and then use that inventory to determine the market value and cost of removal of the furniture. If the market value is sufficient to overcome the cost of removal and disposition, COG will make you an immediate purchase offer for your furniture. Call, click or visit us today to begin your office furniture liquidation process.